Now Supports Gold, Silver, Platinum, and Palladium! 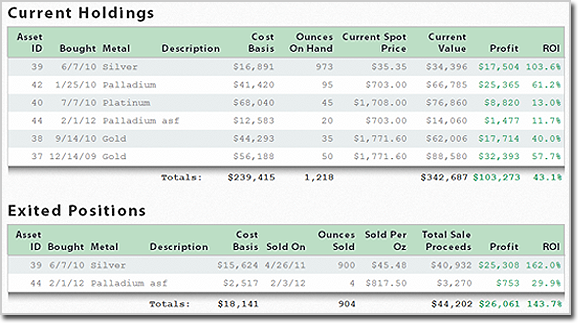 The best way to manage your precious metals portfolio. 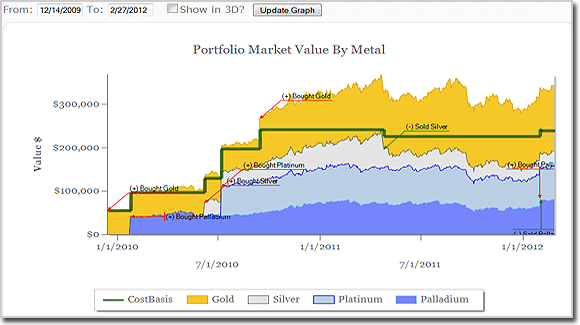 MetalQuick - track your portfolio performance, basis, value, and much more. Get daily portfolio updates and stay on top of the market in these volatile times. Be simple. Be smart. Be quick. We filter out the noise! 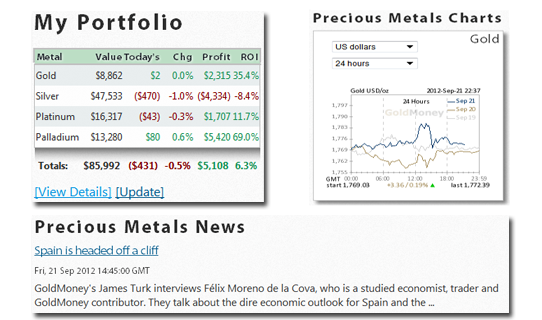 Your Dashboard shows you an up to date view of your portfolio, the market, and the latest Gold and Silver News so you can keep up to date quickly. Never have a doubt! With our reporting tools, you always know exactly where you stand. 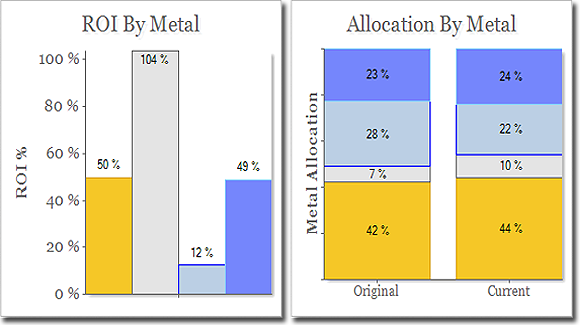 This important graph shows you the value of your portfolio by day and metal type in contrast to your cost basis. So you'll know at a glance if your ahead of the game. 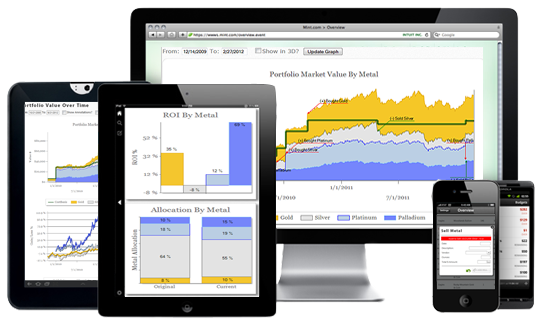 View the performance of your current holdings and exited positions in one place. How Do My Metals Stack Up? At the end of the day, the most important indicator of your protfolio performance is the Return on Investment. This creates a direct "Apples to Apples" comparison of how each metal type is performing. Keep tabs on how your portfolio is performing, by simply checking your email. Now for Premium users, get daily mid-day portfolio updates direct to your inbox! 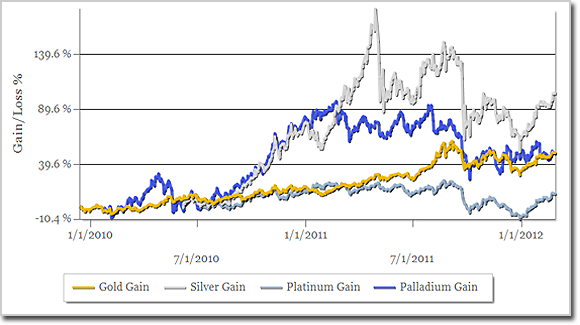 Before MetalQuick.com, I was lost with where my gold and silver holdings stood. I wasn't able to know the current value of my portfolio or see how it had been performing. MetalQuick.com makes this a snap. Now I can see my total holdings and performance in one click. Like they say, "If you can't measure it, you can't manage it". Until MetalQuick.com came along, I was flying blind or spending hours trying to figure out the value of my positions. 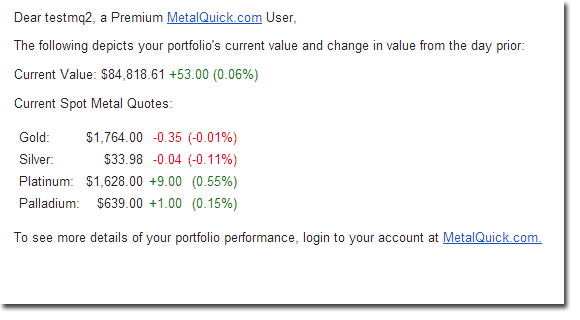 But with MetalQuick.com, I understand my gold and silver holdings with the click of a mouse.